I have to admit I have never made a prop before. So, when my nephew text me about a steampunk gambler costume he was putting together for a Sac Anime event this coming January, I was intrigued. I offered to help, noting that I don’t sew anymore. He told me he needed a steampunk pocket watch but couldn’t afford to buy one. He wants it to look like a large gear and have his logo on it. I said I would do it! Lots of special effects makeup artist create props as well. I figure this would be a good small project to start with. Now I just have to figure out HOW to do it. 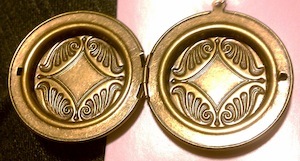 I bought a large locket to use as a base for the pocket watch, but what do I put in it to make it steampunkie? Can I just slap some gears on it and call it steampunk? NO! I don’t want to do that. I was thinking I could use some sculpey to build it out. Place a clock face image inside one half and cover the image with some resin. I am also going to check thrift stores for broken watches. However, before I start mashing stuff together, I need to do a few sketches and continue researching different Steampunk looks. Have you made any steampunk items? If so, leave a comment, send a picture and tell me about it! Open locket I will place watch image in. And now, for your entertainment, here is what I guess would be considered steampunk rap? Whatever it is, I found it funny. 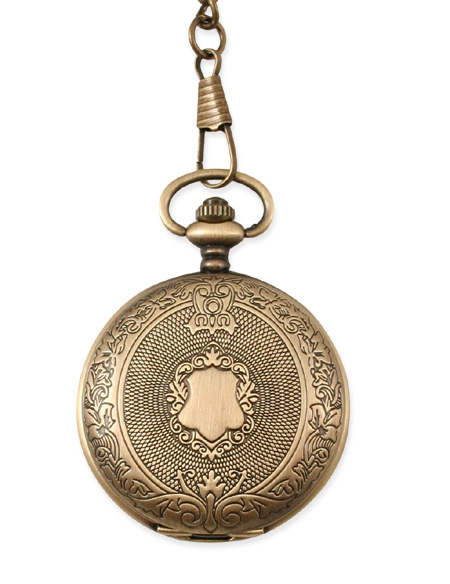 I look forward to seeing your steampunk pocket watch. I have only dealt in steampunk home decor so I hope that you post a picture. Gears, springs, and a mini hour glass would be my idea. Good luck with it. Thanks! I finished the pocket watch. I will be posting about it soon.